Congratulations to Amanda W and LeeAnne C, winners of our Christmas in July giveaway! 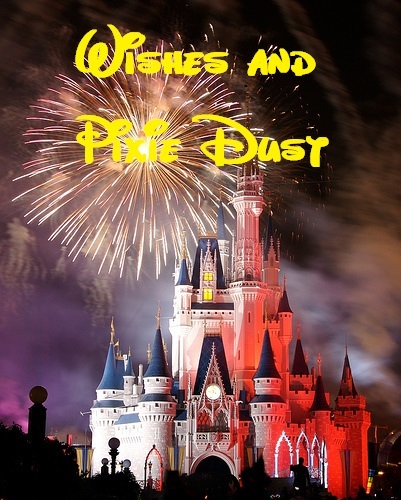 Please check your email for information on claiming your prize, and thank you for your continued support of Wishes and Pixie Dust! If you follow us on Facebook, you may have noticed that we were listening to Christmas music from the Music Choice cable channel- Christmas is our favorite holiday and loved that we could listen to it during their “Christmas in July” promotion. July 25 is the official day of “Christmas in July”, and coincidentally, it is also the first day that we arrived in Florida! Tomorrow marks our three year anniversary, and we decided to celebrate with a giveaway! 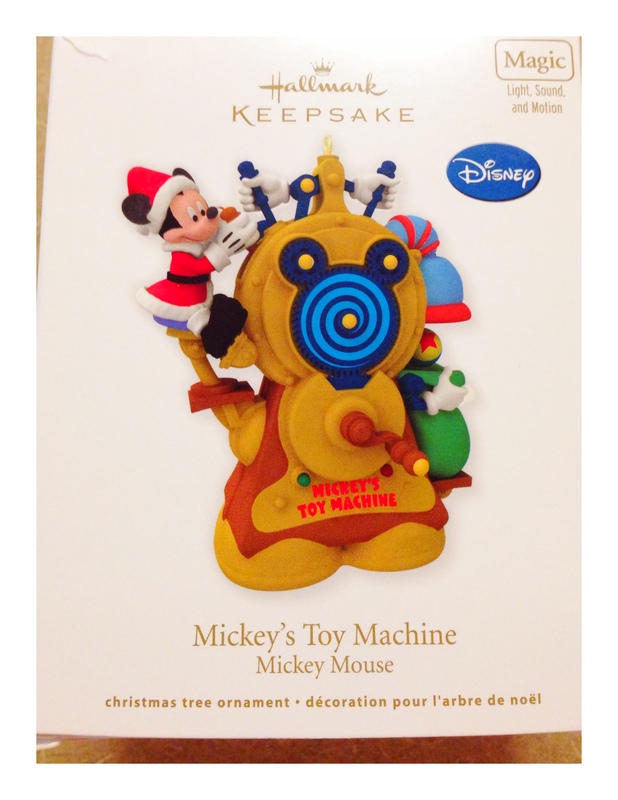 Last year after Christmas we were gifted with two Mickey ornaments from one of our readers, and we wanted to pass them along to you: Magician Mickey and Mickey’s Toy Machine. There will be two separate winners: the giveaway will run until July 31st; winners will be announced August 1 on this blog, and the Wishes and Pixie Dust Facebook Page. Click on and use the Rafflecopter link below to enter. 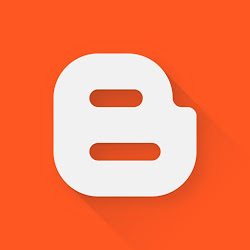 Categories: Blogs, Celebrations, Christmas, Disney, Floridaversary, Moving | Tags: Giveaway, move to florida, moving to florida, Relocate, Relocate Florida, Relocate to Florida, Relocation, Relocation Blog | Permalink. 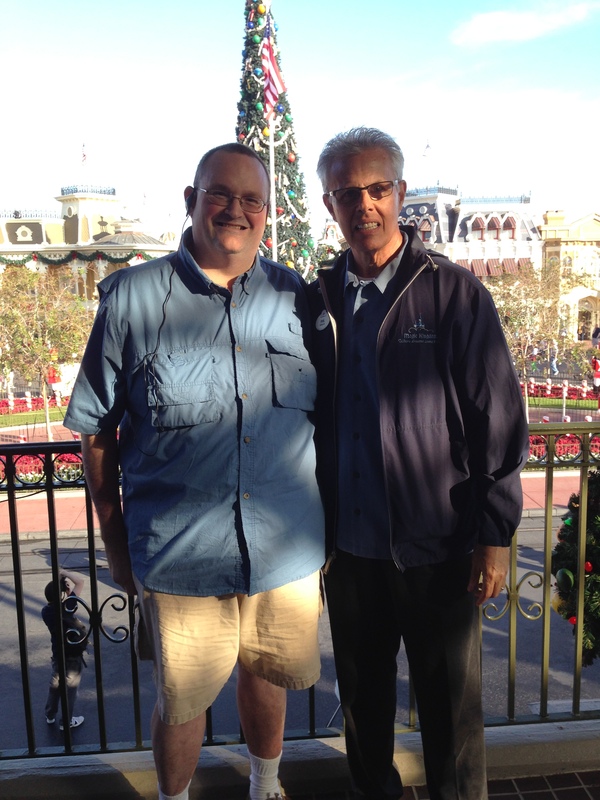 This past Wednesday I was able to participate in a Disney Parks Blog Limited Time Magic opportunity; a walk through the Magic Kingdom with Phil Holmes, the VP of the Magic Kingdom (MK). I wanted to share this tour with you. 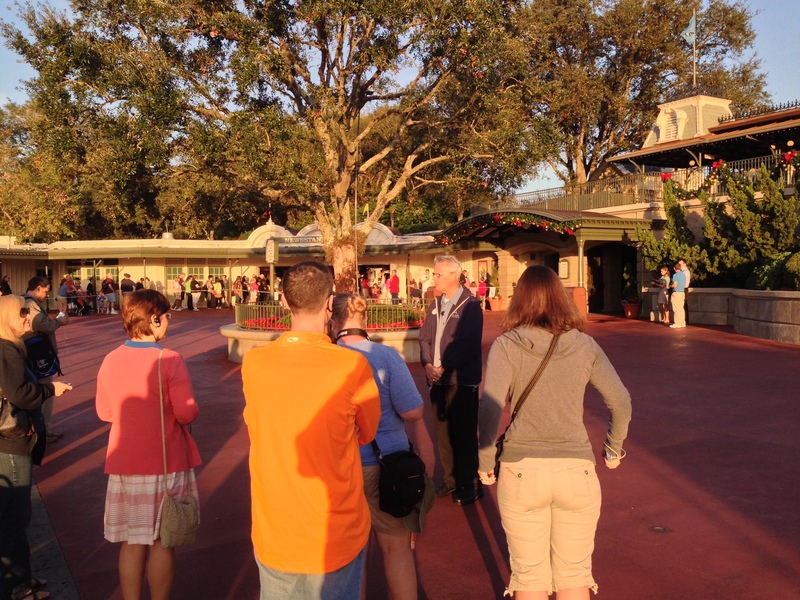 We started outside the main gate at 7:45am with Phil telling us that this tour came out of the Park walk-throughs that he asks his new leaders to do as they join his team. This is done so that the leadership can gauge what the frontline Cast Members (CMs) see and hear during their days. This lets Disney provide the best experiences for the Guests and it is those top flight experiences that in turn drive the Disney ‘machine’. 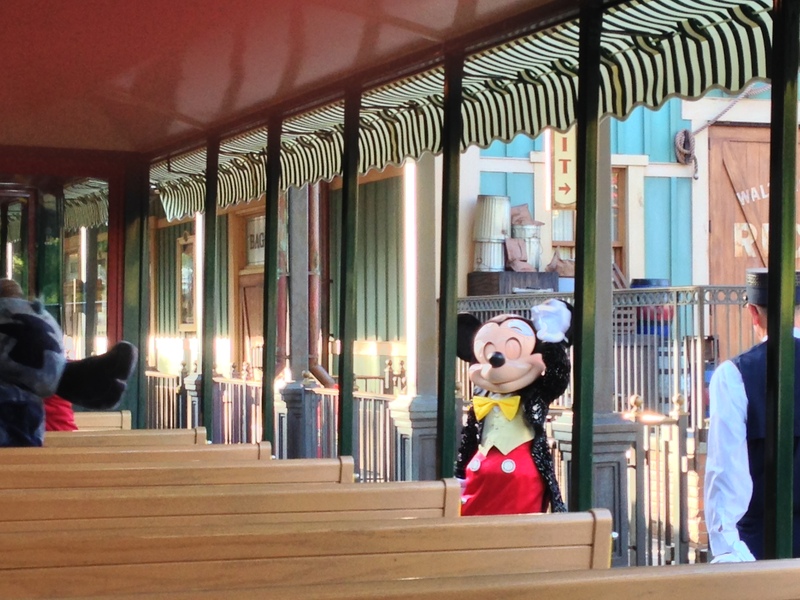 By providing the best for the Guests, Disney takes care of the financial line without worrying about the bottom line as most companies do, the bottom line takes care of itself. 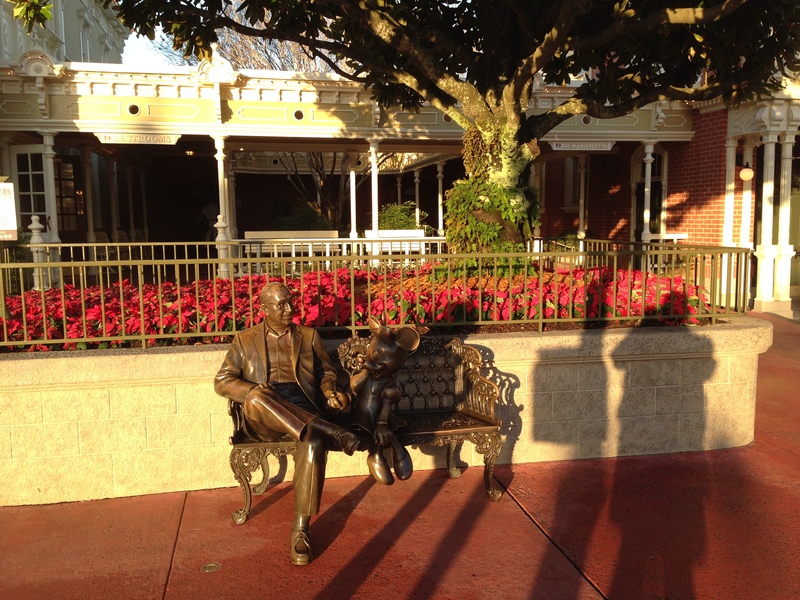 Our first stop was at the Roy Disney/Minnie Mouse bench in Town Square. 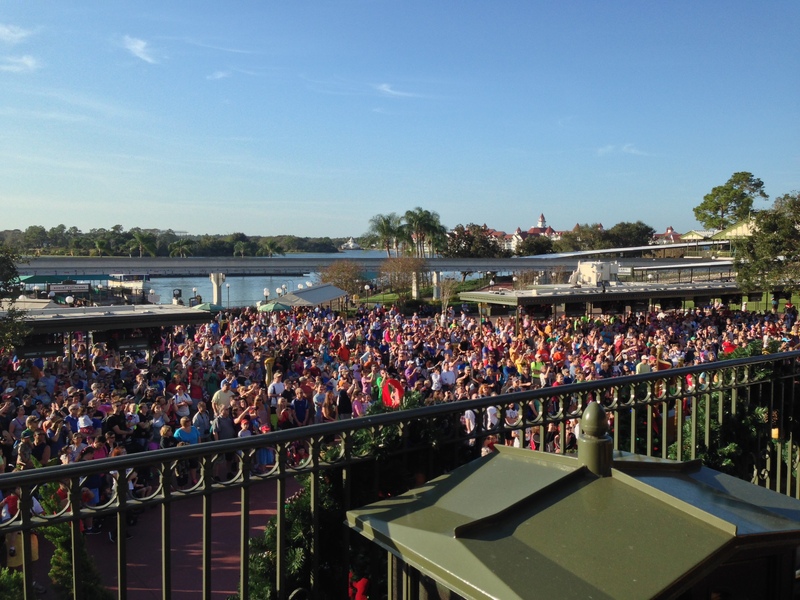 Phil shared his story of working construction for Disney World before it opened and how he saw how differently Roy acted in comparison to how he thought a company leader would, particularly in seeing Roy bus away his own tray as well as others’ after lunches in the construction cafeteria. 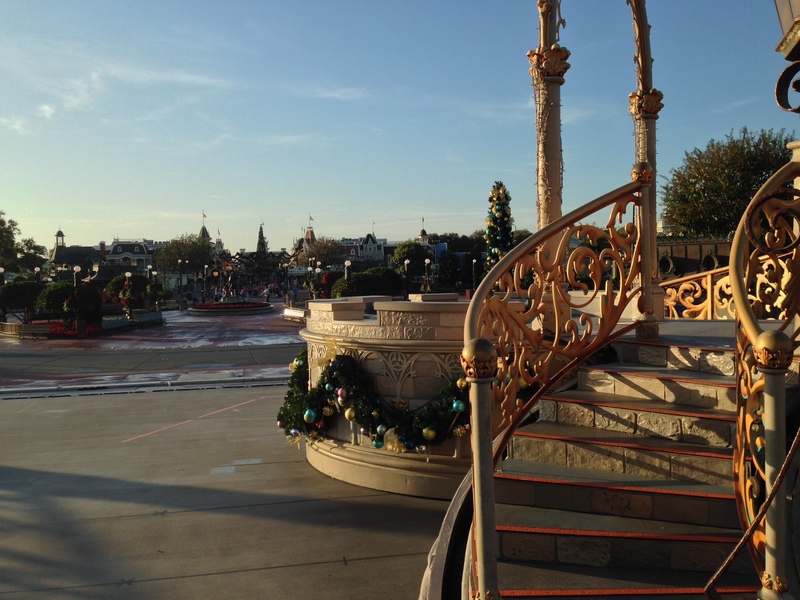 We walked down Main Street taking in the view of a near empty Park (some early ADR Guests were in by this time) and Cinderella Castle. We stopped in front of the Castle to view a card showing the many different ‘variations’ the Castle has had over the years. 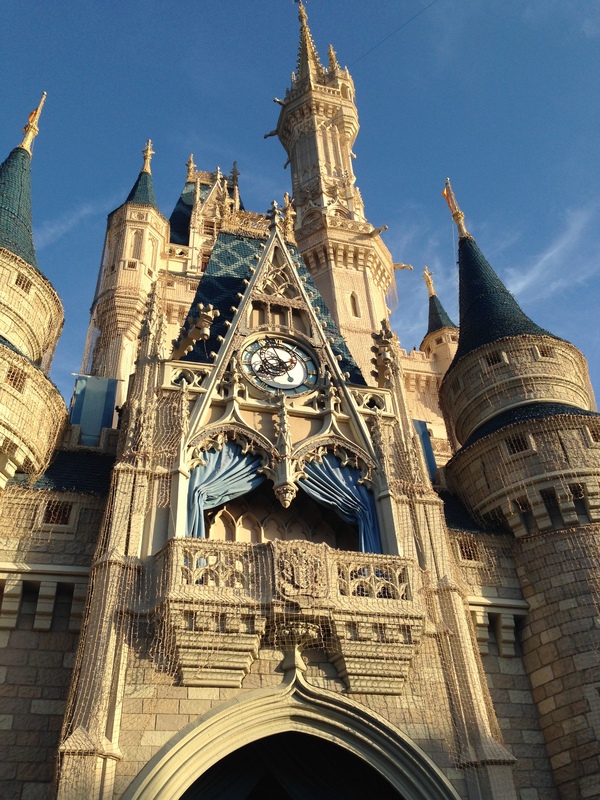 Phil did quip that the comment he most hears about the Castle is how bad the 25th Anniversary ‘Birthday Cake Castle’ was and that it shouldn’t be done again (personal thought here – I agree). His story here was simple, that Walt’s vision for Disneyland and Disney World was that they weren’t built to be museums, static and never-changing. They were meant to change and evolve and to always bring new experiences. 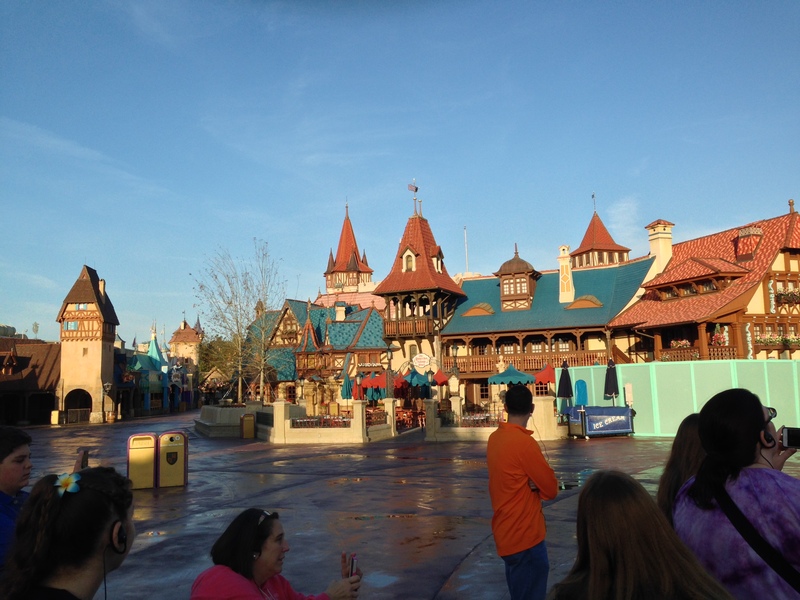 To exemplify this he told how the current colour of the Castle isn’t the same as it was back on Opening Day. A few years back the designer of the Castle in Paris came to him and Meg Crofton and suggested that the colouring schemes used there would also fit the MK Castle as well. And so, with confidence (and the thought that if it didn’t work they could always re-paint it) the Castle was re-painted…and it looks wonderful. From here we walked up to the Castle’s main entrance and behind the Castle Stage. 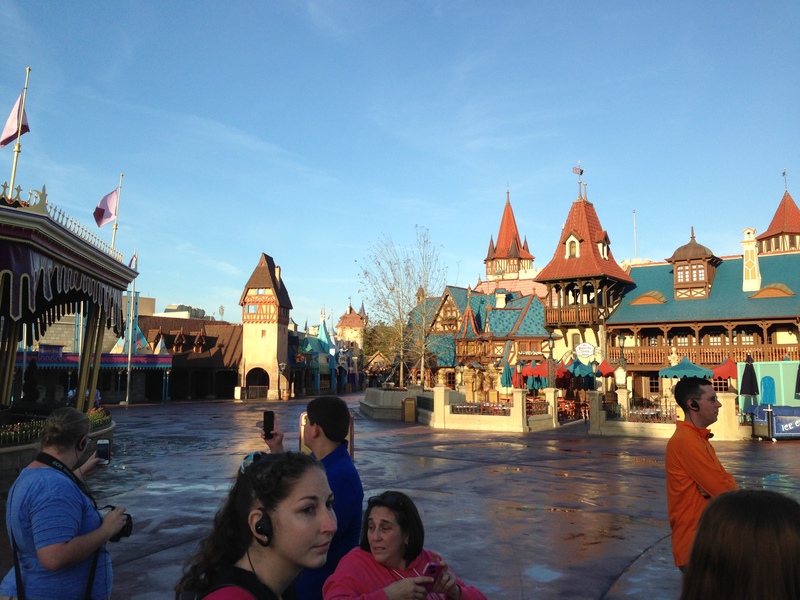 We could see back up a now empty Main Street and into the Hub. Phil told us here what he had said back during the 40th Anniversary Celebration (which we had attended 2 years ago) and reminisced on his time as a CM at the Haunted Mansion on opening day; a job he got after impressing his boss while working construction and being offered a job “inside in the air conditioning”. 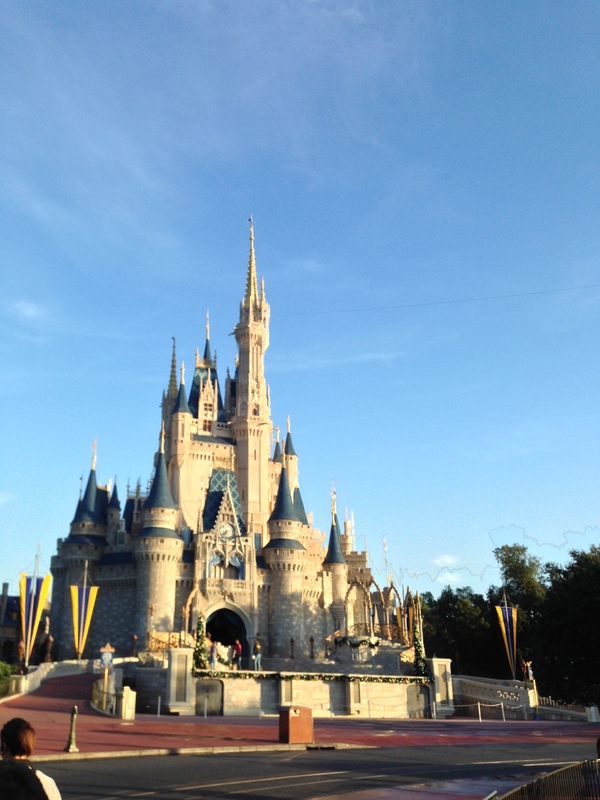 We then walked through “the hardest working Castle in the world” and into Fantasyland; the ‘heart’ of the Magic Kingdom. 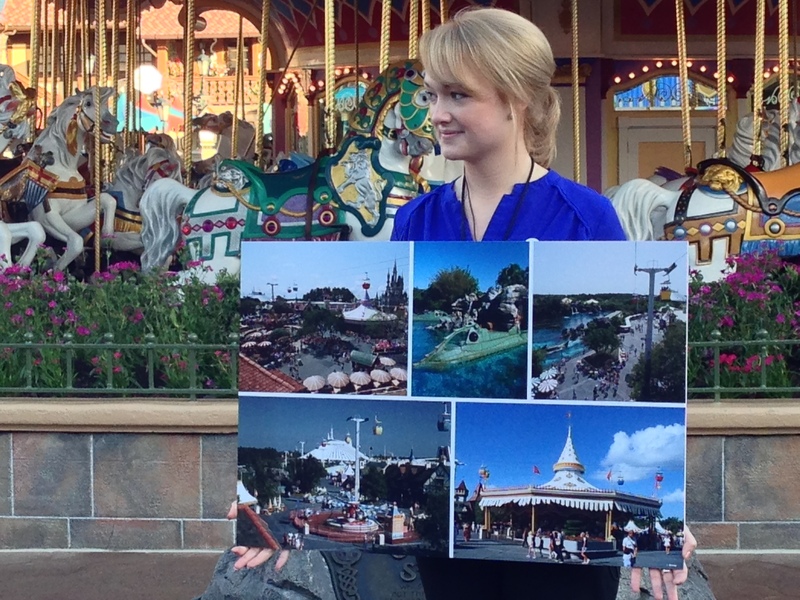 Here we saw photos of Fantasyland as it was opening day and how it has changed over the years. Phil explained why the decision was made to replace Snow White’s Scary Adventure with Princess Fairytale Hall. This was because on Opening Day and for years you met the Princesses in Fantasyland but they had since moved to places they just didn’t belong, Mickey’s Toontown Fair and then Town Square; and that the fairy tale Princesses belonged in Fantasyland in the Castle. 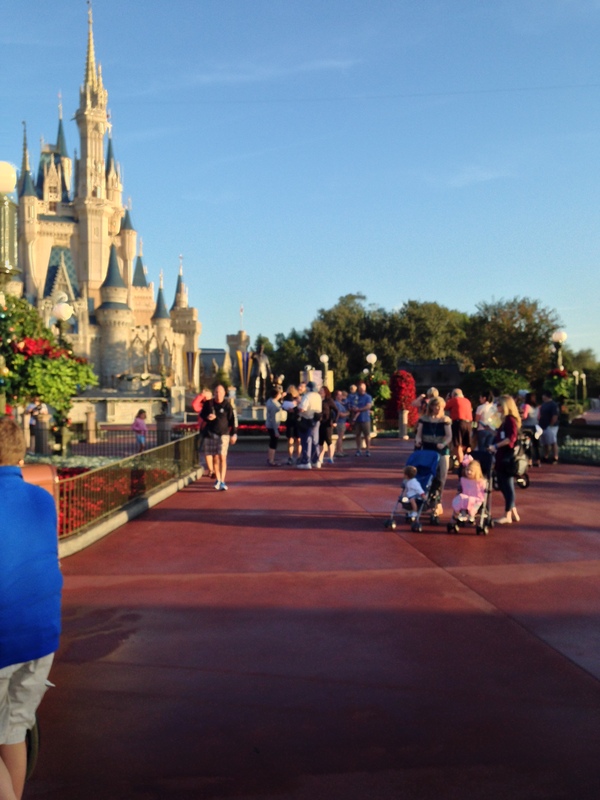 Since there was no room in the Castle, they picked the next thing, the show building next to it. He told of how he questioned the Imagineers on the need for Castle Walls being added as part of the New Fantasyland expansion; agreeing once it was explained that the walls ‘close off’ the Castle Courtyard and transition you into the Villages and Enchanted Forest of New Fantasyland. He also told us here that we’ll never see the true classic attractions close; mentioning “it’s a small world”, “Pirates of the Caribbean”, “Haunted Mansion” and “Peter Pan’s Flight”. We’ll see them change and evolve, using the addition of Johnny Depp’s Jack Sparrow to Pirates as an example, but not closed. We walked into New Fantasyland first stopping at the Be Our Guest Restaurant. 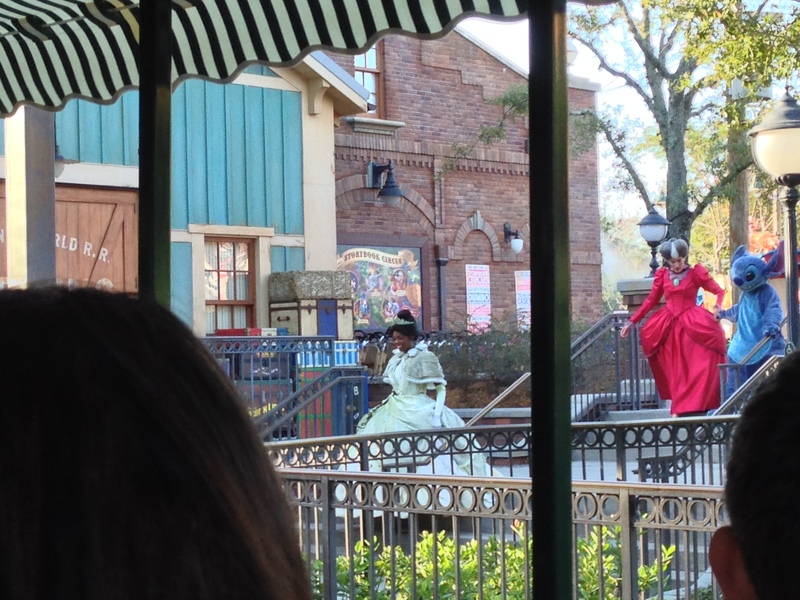 Here we heard how the designers wanted to feature a restaurant as the centerpiece of the expansion in order to provide a new experience not available in the Park before and in a way to make it accessible to all; counter service for lunch and sit-down service for dinner while encompassing the Guests into the Beauty and the Beast story. 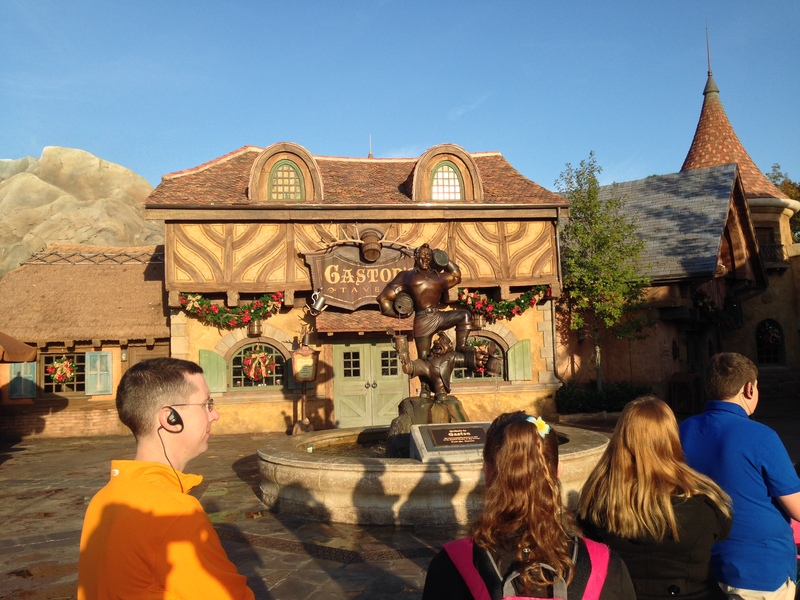 We walked into Belle’s Village where we learned that having Gaston meet here was an important piece as he was highly requested and seldom appeared outside of Epcot and that his Meet and Greet has become a very popular and interactive experience. 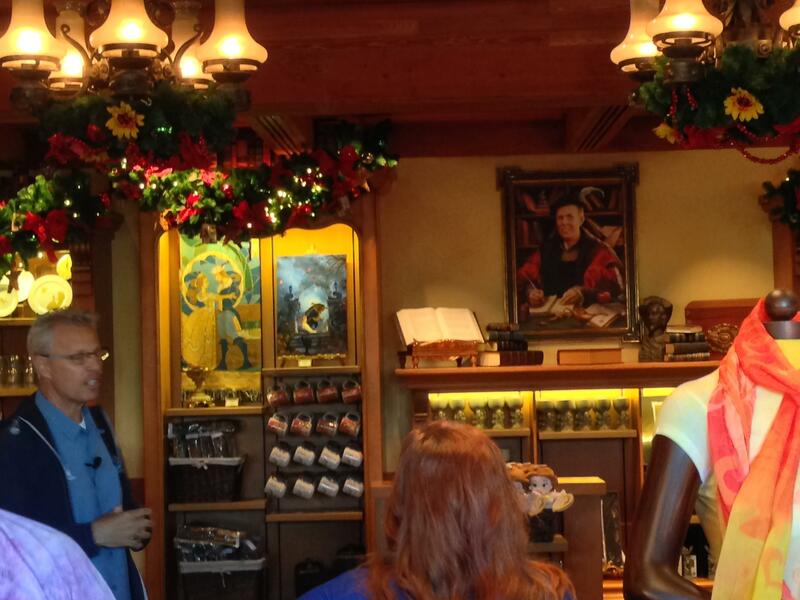 We visited Bonjour Gifts where Phil posed with the portrait of “his ancestor” that hangs there. I asked him here what the ‘story’ is behind the ‘little door’ behind the Shoppe. 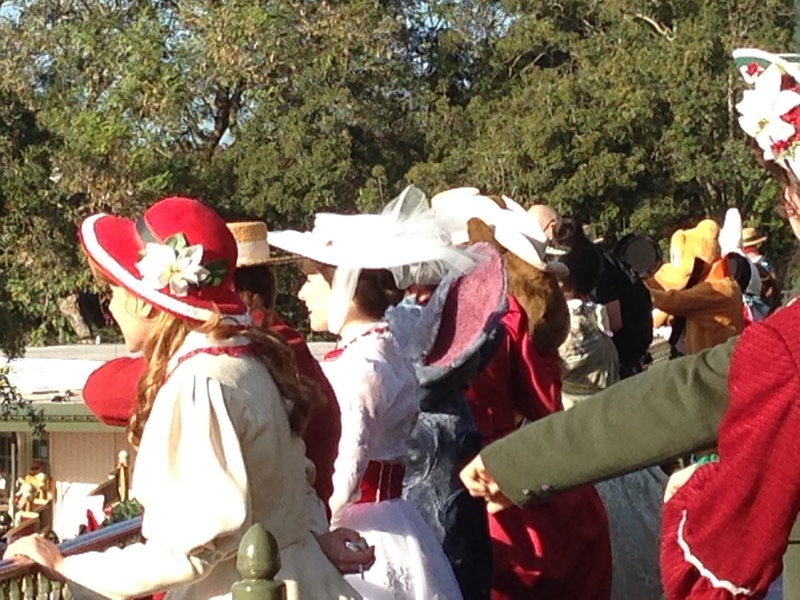 He had no real answer, saying that it was a great way to theme a utility hatch, but if Guests wanted a story, he’d have to ask the Imagineers to create one; perhaps a door for Mrs. Potts to use to visit the Shoppe. 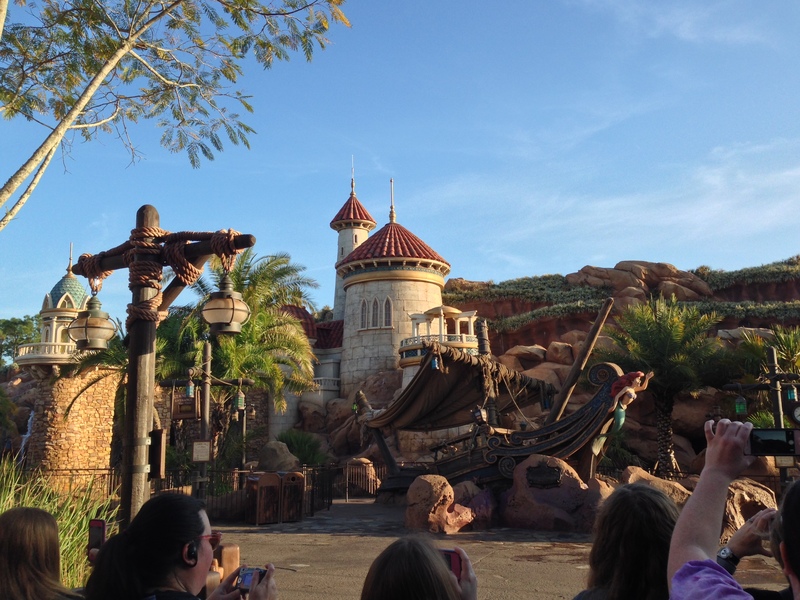 Last we visited “Under the Sea: Journey of the Little Mermaid”. 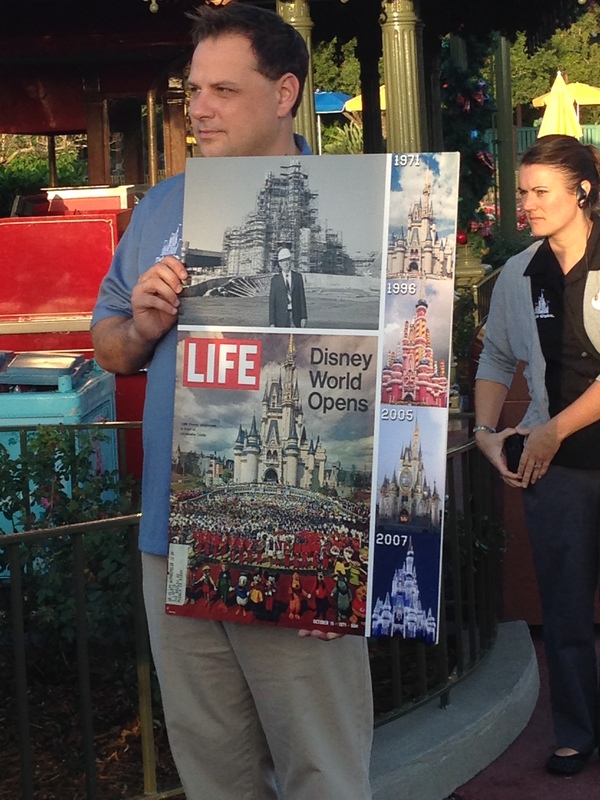 Here we learned how the Imagineers learn all the time how to apply new technology and methods even to older attractions. In this case it is the grass. 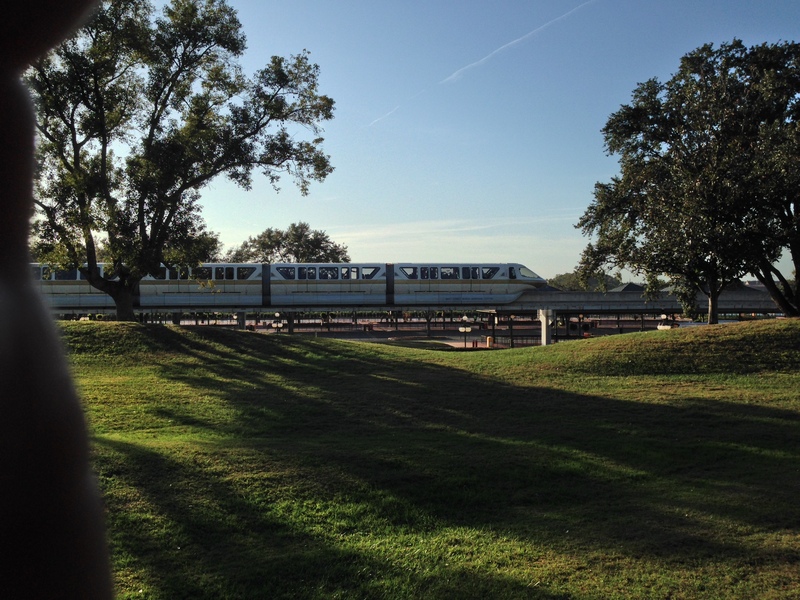 The grass covering the outside of this attraction is so realistic that many do believe it is real. This can now be applied to other attractions that feature grassy areas, specifically mentioning Splash Mountain, to make them more realistic. 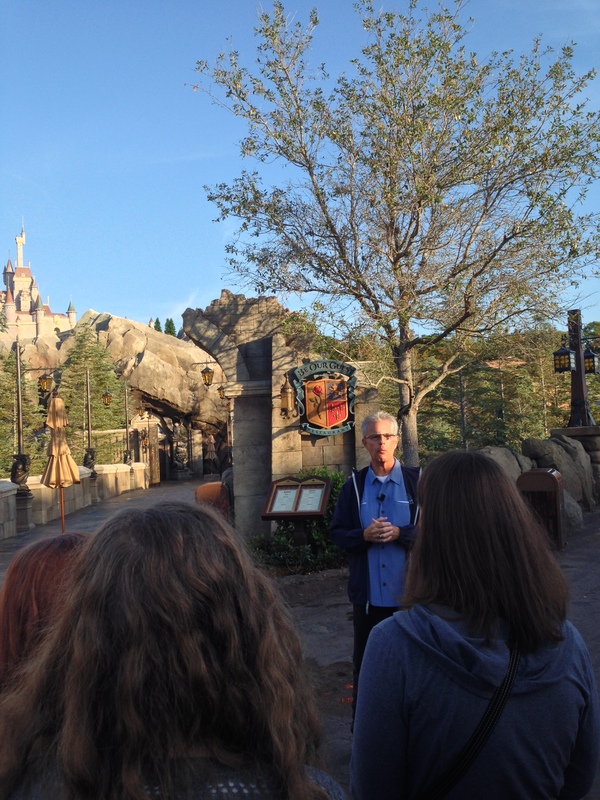 We also learned that the Seven Dwarfs Mine Train Coaster is on schedule to open pre-summer of 2014 as planned. This coaster was designed with families in mind, following Walt’s vision that the rides should always be ones that the whole family can enjoy together, including rollercoasters; and this will be one that all can ride and not just the 75% that ride many other Disney coasters like Space Mountain. From here we ventured into Storybook Circus. Here were learned that the vision of Storybook Circus came from designs that Walt Disney had drawn up himself for a never built Circusland at Disneyland. 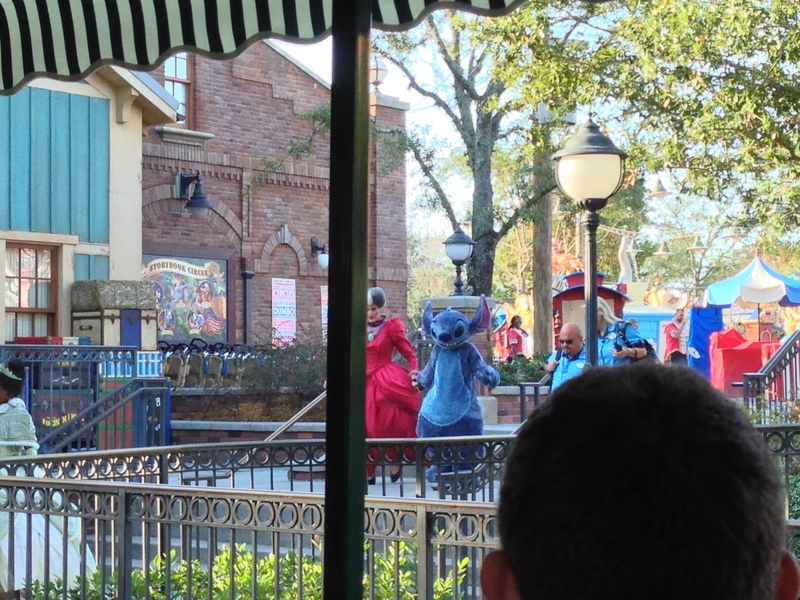 We also learned that research had shown that for almost all Guests, a stay at Disney World couldn’t end without riding Dumbo, so over the years Dumbo was redesigned to add arms and elephant cars but that it still wasn’t enough. Building Storybook Circus allowed for an increased capacity by adding the second Dumbo; but it also allowed for a centerpiece to be built for the area, the wait area that allows for children to play and burn energy while parents enjoy a rest in the air conditioning. 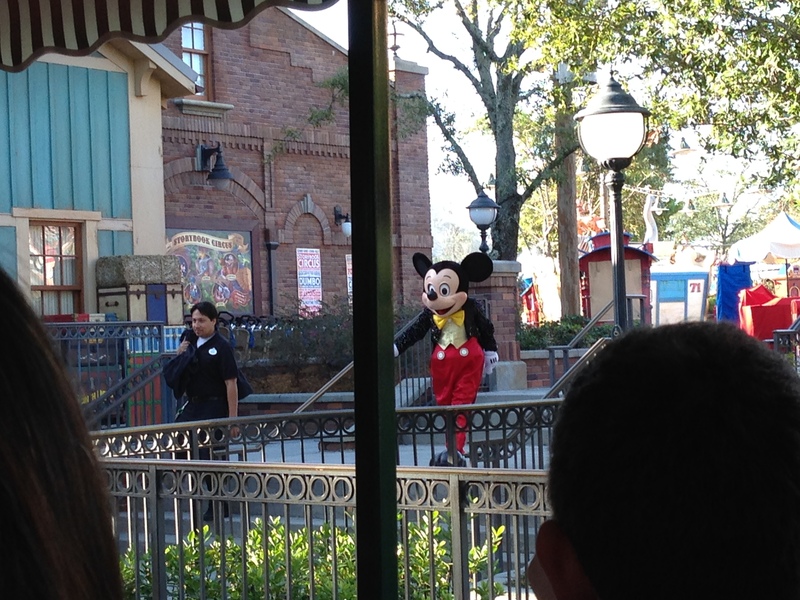 Now came our big surprise as we walked down to the Fantasyland Train Station. 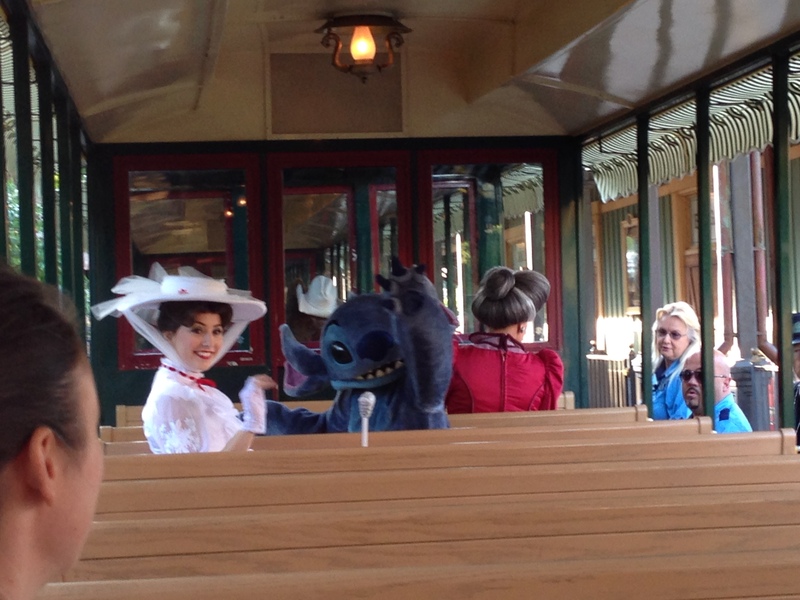 We boarded the train and were told that we were going to help be part of the Magic Kingdom Welcome Show…wow! After we boarded we had a Q&A time with Phil where we learned things such as Limited Time Magic will end 12/31/13 but may come back in future years, there are no plans for ‘Dapper Danielles’ but there were also no plans in the past for female train engineers or other positions so ‘never say never’, the Frozen Princesses will be around for Meets ‘forever’ but not at the Magic Kingdom, Phil’s granddaughters were Batman and Robin for Halloween and more trinkets. 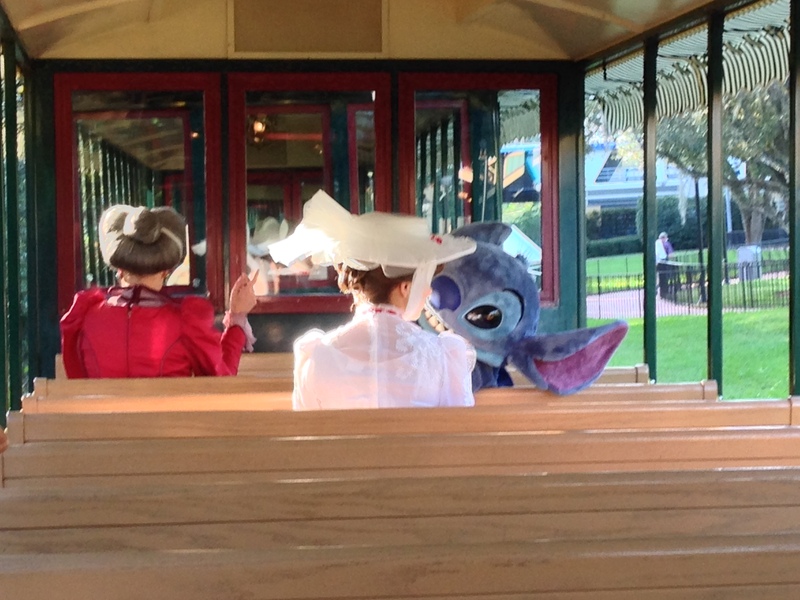 Now it was time for the characters to board; Mary Poppins, Stitch, Lady Tremaine, Pluto, Minnie and Mickey (and more). 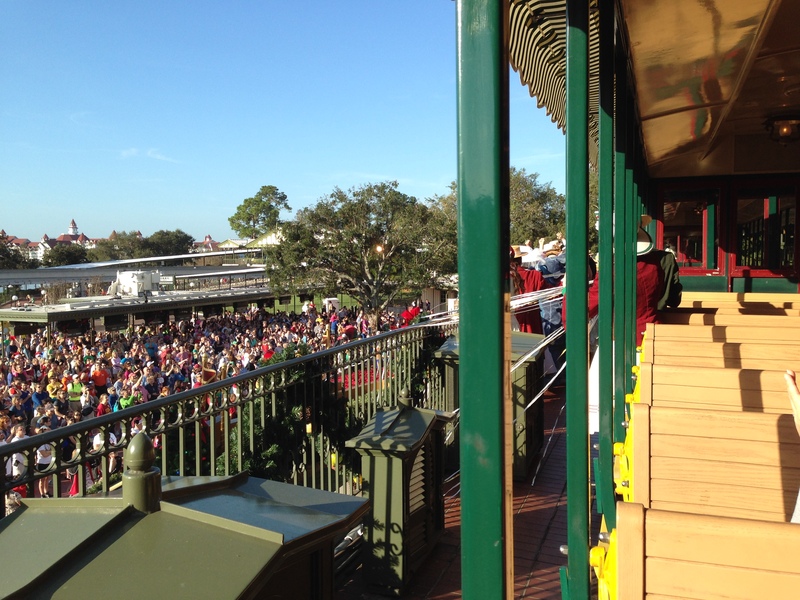 The train circled around to the Main Street Station and hearing the noise build as we got closer and closer was just electric. 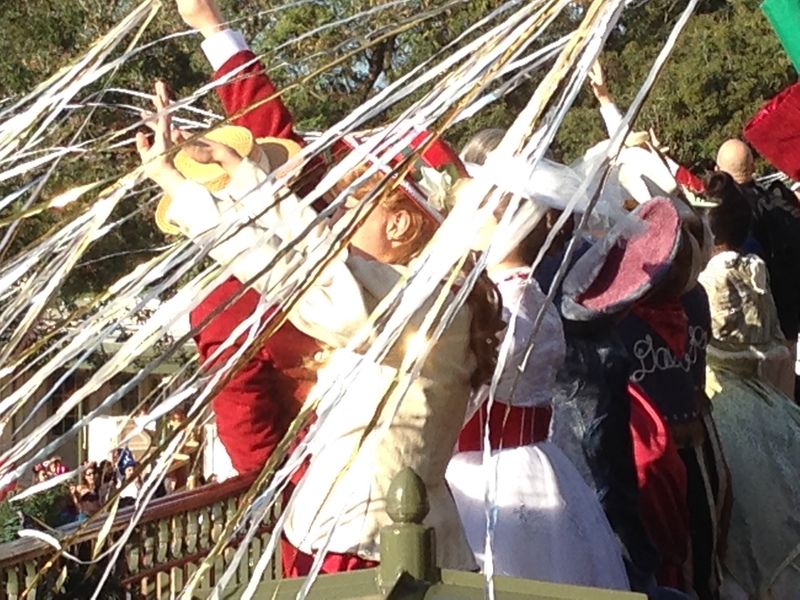 Waving to the waiting crowd and being a part of a show that opens the Park to all each day brought a lump to my throat…it was just pure joy and I was a little boy again. 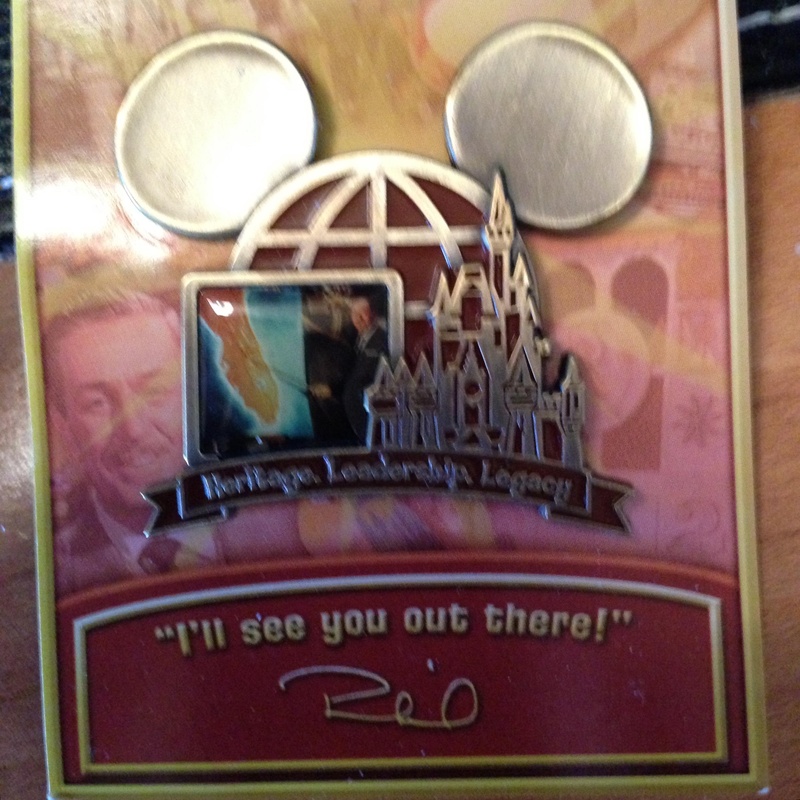 After the show we each had a photo taken with Phil and received a special gift, a Legacy of Leadership pin featuring a photo of Walt in front of a Florida map. A treasure I’ll cherish forever! A huge thank you to the Walt Disney Company, the Disney Parks Blog and to Mr. Phil Holmes for providing this opportunity to all of those who have had a chance to enjoy this thrilling time. 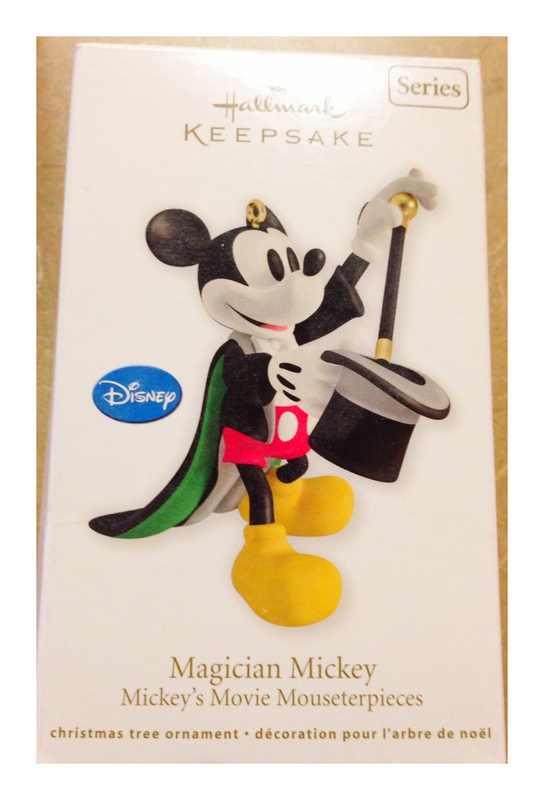 Categories: Disney, Entertainment, Florida, Friends, Moving, New Fantasyland, Theme Parks | Tags: Florida Attractions, Limited Time Magic, move to florida, moving to florida, New Fantasyland, Relocate to Florida, Walt Disney World | Permalink. Categories: Florida, Moving, Travel, Weather | Tags: Florida Attractions, Florida cities, move to florida, moving to florida, Relocate to Florida | Permalink.